We Run CBT courses on Saturdays. Sunday CBTs are available for "special" CBTs. 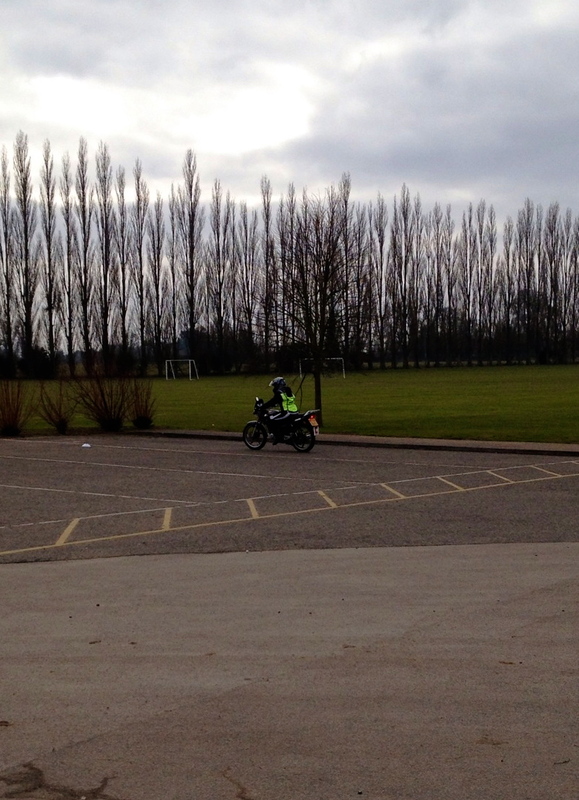 ONE to ONE or Big Bike CBTs as part of a course. More pictiures in the Gallery. Talk direct to an instructor on 07763 018027 or Text a message. Calls taken up to 9pm..
CBT - COMPULSORY BASIC TRAINING is where you start your motorcycle training. It is a course designed and monitored by the Driving Standards Agency. Here is a Video from The DSA explaining it all, Note that this is done in a small space, Our CBT site is 5 times the required size so that you will find it easier, Unlike most Schools who have 6 or 8 students on a CBT we only ever have 2 and we do offer a One to One CBT. For All Training we can Provide Free use of Helmets , Gloves And Waterproofs. CBT is not a test, you will receive instruction all the way through, but you must show that you understand all the theory parts and you can perform all the practical elements. The last part is a ride out on the road you must show that you understand the rules of the road and that you can negotiate a variety of road situations correctly and safely. A novice rider having taken CBT will still need further training and practise before they could pass the motorcycle test. This is an outline to help you understand what to expect. The course consists of 5 elements and they must be completed in order. CBT starts in an off road site. We will check your licence and your eyesight. You will be told about the aims of the course. We will explain the importance of the correct clothing and equipment. The controls of the motorcycle, and how to use them. How to put the machine on and off its stand. How to Start and stop the engine. You will wheel the machine left and right showing proper balance. You will bring the machine to a controlled halt by braking. Ride the machine slowly and under control, including a straight line & a figure of eight. Perform the u-turn manoeuvre & an emergency stop. Carry out simulated left and right turns showing proper observation, use of signals and control. The importance of: Observation, Being visible, Anticipation, Defencive riding, Hazard perception, Road positioning, Following distance, Weather changes, Road surfaces. During which you will demonstrate your ability to negotiate a variety of road situations legaly and safely, this will include, roundabouts, junctions, pedestrian crossings, gradients, bends, traffic lights, obstructions, etc. You will also perform the U-turn and emergency stop again. Brilliant day's CBT. Thank you :) calm and patient instructor. Definately reccommend to others!